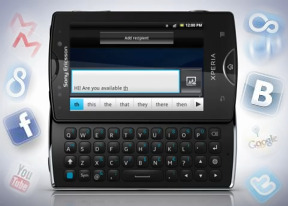 athul007 , 10 Feb 2012guys I need help, my xperia works great, good performance, but there are some scratches on the... moreThe display of this handset is Scratch Resistant, but not scratch proof. shaikh, 10 Feb 2012i want to know whether, i can transfer all inbox n sentbox messages all drafts n messages in f... moreI use SMSbackup+ app to sync my messages to GMail. The Best way to store messages. To users of the Xperia mini pro phone one question: Are you in a moment of establishing a connection with the caller, reported a high frequency noises (like microphony), noise, etc..., which after a few seconds loosing its intensity and at the end disappears. The disorder was of such intensity that it is virtually impossible to make conversations the first 5 - 6 seconds. I am very interested in your experience; because I have the unpleasant experience of this kind, and I am near to return this phone, which is in all other aspects of use - outstanding. Thank you in advance for your comments. AnonD-41711, 10 Feb 2012xperia mini pro or galaxy gio which is better?????????????? ?xperia mini pro of course. xperia mini pro or galaxy gio which is better??????????????? Anonymous, 09 Feb 2012does this ph record sound in stereo while shootin videos...???Yes! Absolutely. Iv been using this phone since august 2011 and iv had no problem till now. earlier the battery lasted for a max of 20 hrs from 100% to 2% after #hrs of music playback and 35 mins of video and 2hrs of facebook or gtalk chat and gaming for abt 30 mins. but now after 2 updates it lasts for one day after doing all that is said above and more. now my phone also features a 3d camera and i highly recommend this phone to everyone. does this ph record sound in stereo while shootin videos...??? am confused between this one and SonyErc. WT19i Live music , which one is better ?